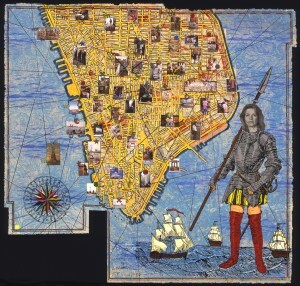 Mapping the Present features a selection of works by contemporary artists who use maps and mapping as part of their art practice. Rather than trying to chart the world accurately, these artists use the visual language of maps to create imagined geographies. The exhibition features collages, constructions, drawings, paintings, prints, and sculptures by national and international artists and explores the many ways in which artists articulate and navigate the world around them. The Museum is grateful to Driek and Michael Zirinsky for loaning these extraordinary artworks.